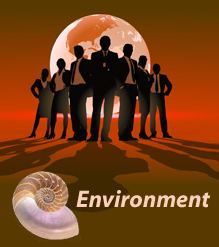 Greenwashderives from the term whitewash and indicates that organisations using greenwash are trying to cover up environmentally and/or socially damaging activities, sometimes just with rhetoric, sometimes with minor or superficial environmental reforms. Industries with fossil-fuel intensive products, including automobile, oil and coal companies, use greenwash to make it seem that they care about global warming and are doing something about it. This can be called climatewash. publicly committing to greenhouse gas reducing actions whilst retaining membership of industry associations or funding front groups that oppose legislation to reduce greenhouse gases. Advertisement for General Motors products shows that their commitment to the environment doesn't extend beyond sales figures. 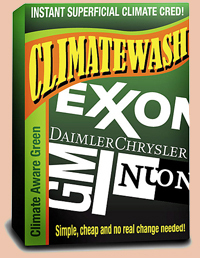 Source: 'Greenwash of the Week: Thanks for Nothing, GM', Rainforest Action Network (RAN), 5 June 2008.